Yesterday turned out to be a lovely, sunny day here in LA. 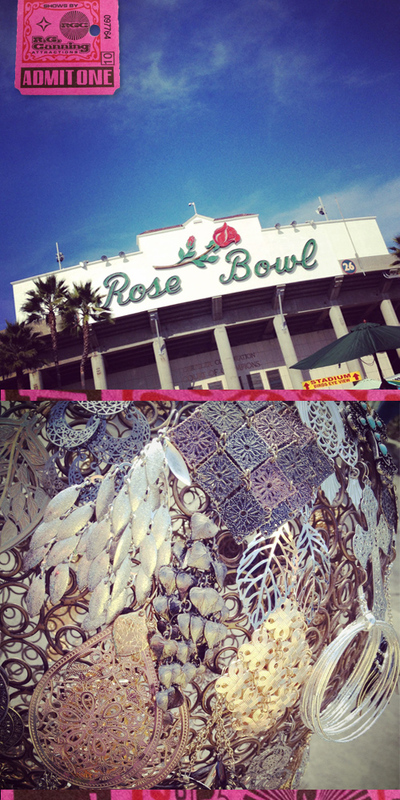 Friends of ours were going to the Rose Bowl Flea Market which I've been wanting to check out for a while but as it's only on once a month, we just never managed to get there until yesterday! I found it relaxing to walk around and look at old/vintage stuff (furniture, dishware, glass, home decor, oddities and other assorted bric-a-brac) as well as the craft stores, trinkets and other market stalls, creative displays and variety of items. We picked up a few bits and pieces, nothing major although some of the vintage glass was pretty nice (I just don't have much space for displaying stuff like that). It reminded me of the markets my family used to go to when I was younger but much larger, somewhat better quality of goods and relatively less junky (for sure less dusty!). If you're decorating a house on a budget, it's a great place to pick up pieces to refurbish or repurpose and also to find interesting decor. Otherwise, with the carnival-like atmosphere, it's a great place for people-watching and creative inspiration.